JuanaMikels.com: Wise Men Still Seek Him & Advent Devotions till Christmas! Wise Men Still Seek Him & Advent Devotions till Christmas! For tonight, see yesterday's blog here. Read Matthew 2:1-8 Why were the wise men looking for the newborn baby? What was wicked King Herod’s real motive in finding this newborn baby? 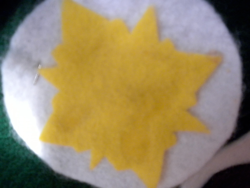 Draw or make a star for your tree. Pray we too, will seek Jesus as the wise men did. Sing, O Holy Night! or listen to it. Below is a picture of our nativity scene on the fireplace mantle. One wise man's head got dislocated and smashed several years ago, but I managed to glue the pieces back and he looks shattered, but okay. Another wise man's head is totally missing. You know what? I still love that paper mâche nativity scene and every Christmas it goes right in the front center of our fireplace mantle. It reminds me of why Jesus came. Without Christ, we are a mess—just like my shattered and headless wise men. We are sinners in need of a savior. No one is perfect except one—Jesus. He set aside His glory in the heavens and came to earth as a newborn babe that first Christmas night and He did it for us—that we might be new creations that will live with Him forever and for all things to be made new in Him. Oh, now you see why my broken, shattered nativity set reminds me of Christ redeeming the world! Let's pray that we will be like the wise men, and follow God each day—to worship Him! Wise men still seek Him! (We do the family celebration below after opening presents on Christmas morning or as an alternative, you can begin with the first symbol from the advent times, the Alpha and the Omega, and take each one down, reviewing the scripture for each one. Sing carols intermittently and end in prayer. We open presents by the tree, and then move by the fireplace for our family worship below. Terry reads and often has our boys read as well, great practice for leading their families one day! We also love to add that new clothes will wear out, and things will break—items offer only temporary satisfaction, but the gifts of the Lord last forever: His love, joy, peace, patience, eternal life, mercy, grace, etc. We have said this every year since the kids were little. When preschool and elementary age, they colored drawings of gift boxes and wrote the gift of the Lord (ex: Eternal Life, Love, Joy, etc.) on the gift, and we attached their drawings to the tree. They are 15, 19, 21, and 23 now, so they no longer draw the gifts, but we will once again, be reminded how the Lord’s gifts last forever. Sing: O Come, All Ye Faithful or Away in a Manger. Thank God for sending His son, the greatest gift ever given! It has been an absolute joy delivering you the scriptures, and preparing our hearts together in preparation and celebration of our Lord’s arrival! Thank you to all the husbands and fathers for leading our families! 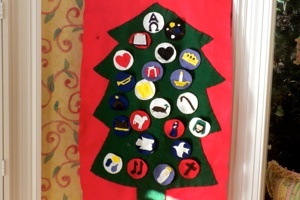 All of the scriptures and symbols for our advent time were selected by Ann Hibbard from her book "Family Celebrations." May you and your precious families have a blessed Christmas!